When I was a kid, part of the fun of Christmas was calling up friends on the day after asking “WhajagetforChristmas?” all in one excited breath, and then interrupting one another exclaiming over what we got for Christmas. I got some antique seed packets! And on the back of each is some wonderful garden advice! Like on the Dwarf German Kale, it says, “…on a moist day after the plants are three or four inches high, transplant to two or three feet apart…” Of course, transplanting is best done on a “moist day”! On the Early Red Turnip Radishes, it says to “use invariably when young and brittle”. I love that though I’m not sure what they meant by “invariably”. Oh well, radishes are best when smaller. On the Black Wax Beans, I found this good advice “Never work among the vines when wet, as it induces rust”. That is good advice and I've tried to follow that for years. And on the Long Green Cucumbers it says “When all danger from insects is past, thin out the plants…” I wonder how one knows when the danger of insects is past? That seems like a good thing to know even today. I don’t know the age of these seed packets because they aren’t dated, but I did find some information on collecting antique seed packets on The Labelman's website and see some on that site that are similar to what I got for Christmas. Many thanks to my sister-in-law who thought to buy these seed packets way back last spring, then rigged the Christmas name drawing so she would get my name. Wasn’t that nice of her? How in the world did she know that I would like antique seed packets? Hey, this might lead to a new collection for me! Those are really interesting and pretty too, Carol. Merry Christmas to you and thanks for a year of amazing posts from your heart and your garden! Your sister-in-law is so thoughtful. Those are really neat. I'm excited about my new potting bench. A composting canister and William Cullina's new book were my garden-related gifts. Those seed packets are really nice! Unexpected offering from my grandmother: some of my great grandfather's hand tools, including a hoe. 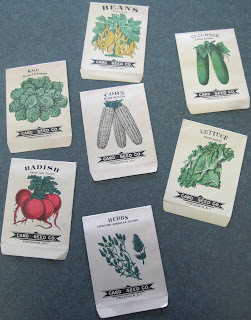 Those seed packets are so cool! I would keep those empty seed packets and use them as bookmarks. I got a bat box and a lacewing hotel. Well, Carol...those are delightful. I hope you invariably eat those radishes when young and brittle, and remember to plant your kale on a moist day. Hopefully when the danger of insects is past. I didn't get anything gardening related, except--my hubby got a Lee Valley card and I got a card from a store I don't shop at for myself. We're gonna swap. Then look out! I gave two gardening magazine subscriptions plus floral calendars to others, tho. I like the giving even more than the receiving. I received many pairs of earrings which I love and for my garden, I received for pieces of garden art. I love tucking my garden art in among my plants. I have a very neat 'bad hair day' wall art for the fence made from scrap metal...it might be my favorite. Neat gift! I got storage bins and shelving, and help with cleaning and organizing the shed! I got an electric leaf blower/mulcher, which is just what I wanted. My son gave me a cool planter for outside and my daughter gave me a very pretty lantern. Those seed packets are pretty. I like to see how things change over the years. They would make a good start for a collection. I received a new pj which I am wearing because I am getting ready to go lay down and read the new book I received, 'Today's Botanical Artists'. I also got 'Flora Mirabilis'. I can't hardly wait to have time to read both. On the lottie front ~ Gardening books(4), Gardening Body warmer, Gardens Calendar, CD of the sounds of nature, Vouchers for garden center! I gave my husband a piece of garden art.... a smallish metal word... "Dream". He gave me a wildflower calendar. My girlfriend bave me a large pinecone stuffed with bird treats to hang out and a beeswax candle with all sorts of herbs pressed into it. In days gone by, "invariably" was used the same way we use "always" now.... you don't vary from doing .....whatever. Those are so nice and that is thoughtful. I like the art on those old fashioned packets. I didn't get anything garden related but I did get some much needed silverware. Carol, Merry Christmas to you and peace and joy to you in the coming year. Love the seed packs and Igotagreatbirdhousecheckitout! What a thoughtful gift. Perhaps you could frame them.. I got tan, from traveling, and inspired, by looking at your seed packets. I usually start my first seeds in January. tick tock...tick tock... Can't wait. Unfortunately, I didn't get any gardening gifts at all, but we did get a white Christmas. Right now I need a snowblower more than a garden hoe. That is a fantastic gift from your sis. She was spot on with that gift! The guys got me a Doug Tallamy book and a fantastic tripod. I am thrilled with both. Your seed packets are really cool! I got a brand new folding pruning saw which I needed very badly. That and a lot of other stuff which didn't have to do with gardening so I won't enumerate it here. I just love those old-fashioned drawings. I wouldn't mind a t-shirt or two with those packets on them! I didn't get anything garden-related for Christmas, because people assume I have it already. I never did get the Chia pet I wanted (sniff)! Carol, The man told me that he thought the seed packets were from about 1910. Later, Your Favorite Sister-In-Law.